Another foundational skill that I include in my curriculum is synthesizing data and information. As students conduct research, they generate a large amount of raw data. By itself, this data isn’t very useful. It isn’t actionable and doesn’t help the student move forward with their creative design process. Students make sense of that data by interpreting it; they learn to make sense out of it. Synthesis is about making informed inferences, leaps from raw data to insight. This is a hard skill to learn, and students are taught several different methods to help them make these inferential leaps. Students make sense of data collaboratively, instead of by themselves. Students are encouraged to work in their teams as they progress through the mess; working in a group offers multiple perspectives on any given data, allowing for more broad interpretation of that data. When there is a visual sketch drawn on the whiteboard, students can modify it as a team. It isn’t precious; it becomes a shared way to make meaning out of data. Students develop models that they can use for further design. A diagram isn’t just a communication mechanism. It can be “used” during further design phases to understand how a new idea will influence the model. For example, students may work together to build a model of the behavior they saw during research. Once that model is created, it describes the existing state, capturing existing behaviors and activities. Now, students can introduce new ideas into the model, and see how those changes impact behavior. Can they make someone’s life easier? Can they change the way a system works? The model becomes active, rather than passive—it’s “used” to craft new ideas, just like a hammer is used to bang a nail. In addition to making diagrams in order to learn how to synthesize data, students also learn to develop insights. An insight is a provocation, a statement about human behavior. It makes an assertion, and then it acts as criteria to judge future design ideas against. If a student is exploring the topic of banking, they may write an insight like “People have a hard time saving because they only think about purchasing decisions in the short-term, rather than the long-term.” They write that insight based on their research and diagramming, and I encourage them to state it with confidence. They may not know that it’s true all of the time, but it was true some of the time. And because it’s provocative, it demands reaction. It leads to new design ideas. The more provocative the insight, the more innovative (and risky) these design ideas become. This synthesis process is a new way of thinking for students who have been taught that you need “all of the data” before you can move forward. I want them to learn to move forward with just enough data, moving as quickly as possible towards a working hypothesis about human behavior. Student consistently struggle with synthesis. It feels overwhelming, and it’s hard to see progress being made during the process. Ambiguity is frustrating. It takes time to arrive at insights, and students feel as though they are wasting time and spinning their wheels. I believe that any interpretation is valuable even when there’s no obvious forward momentum. But in the moment, students don’t see that. It’s my job as a facilitator to help them see why diagramming and exploring insights are valuable, and that they are making progress as they assign meaning to data. Often this means synthesizing with them, instead of coming in and evaluating what they’ve already done. I’ll get into the weeds, sketching diagrams and provoking new insights. Students see how long it takes to marinate in the data because they can watch me spend a large amount of time with each group. Students also struggle because they don’t know when they are done. There is no right answer, and so synthesis could go on forever. They don’t have the experience to see when they’ve worked through ambiguity to arrive at simplicity. It’s my job to help them see that. I do this by leveraging their visual models and their insights in order to sketch new ideas, solutions, and innovations. I create new design ideas in front of them, sketching how they would work and how they would help people. I make the connection between their synthesis efforts and my ideas obvious, and students can start to emulate how I use their sensemaking structures to drive creativity. Synthesis is a fundamental skill that all students should learn. It’s how we make sense of the world around us—it’s a form of active sensemaking that integrates new knowledge into existing worldviews. And it’s the backbone of critical thinking and decision making. 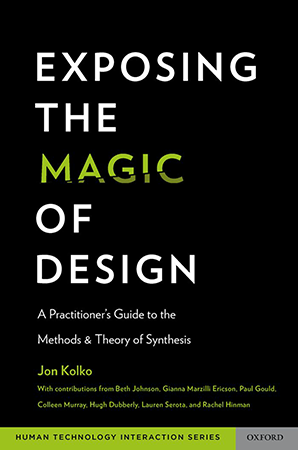 You might find my book Exposing the Magic of Design: A Practitioner's Guide to the Methods and Theory of Synthesis useful in helping your students understand how to make sense of complex amounts of data.